Multiphoton imaging of glomeruli. Images were obtained by combining two photon fluorescence (TPF) signal images with second harmonic generation (SHG) images of an unfixed human glomerulus. The kidney is a key organ balancing blood and body chemistry through filtration and reabsorption. The control of blood flow and pressure through the kidney is crucial for maintaining this process. Researchers at the Universities of Bristol, Exeter and Nottingham have been investigating the structure of the human glomerulus, tiny 0.2mm tight knots of thin walled blood vessels which allow the filtration of blood into attached tubules within the kidney. Previous studies into this microscopic structure have avoided using the physiological pressures of blood in preparing the kidney. Much like pumping up a tyre, without the correct pressure, the tiny blood vessels and tubules within the kidney structure collapse when removed from the body, which leads to misinterpretation when studied under the microscope. The paper ‘Novel Haemodynamic structures in the human glomerulus’, published in American Journal of Physiology, has shown that human glomerular blood vessel architecture is not as depicted in current texts. 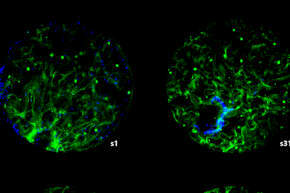 Accurate 3D reconstruction of the glomeruli has defined new blood vessel regions, called vascular chambers (VC) which challenge current narratives of the human glomerulus developed over the last 170 years. The work involved microscopic accuracy as the glomerular blood vessel structures are minute. A filtering human glomerulus is 0.2mm in diameter and the attached reabsorbing tubule is a 5cm long but only 0.06mm diameter - over a million of these fit into two fist sized kidneys. 3D reconstructions were made from fresh or fixed human kidney cortex using conventional light microscopy, confocal microscopy, multiphoton microscopy and transmission electron microscopy. These newly discovered structures may play a role controlling the flow of blood and filtrate and pressure balance in the human glomerulus. The unusual finding is that smaller species appear to lack VC and smaller glomeruli (such as those found in children) may not contain VC as they scale with the glomerular size and are just too small to have VC, but this remains to be confirmed. By understanding the in-depth structure and physiology of the kidney, researchers will better understand kidney diseases. Lead author of the study Chris Neal from the University of Bristol, believes this finding may have a huge impact on understanding a wide variety of kidney diseases. This study was supported by The Richard Bright Research Trust until 2014 and then by Kidney Research UK (2014-2015) and carried out in the Microvascular Research Labs and Bristol Renal. Early parts of this study have been presented to the British Microcirculation Society annual meetings 2011, 2012 and 2013, 2014, 2015 and to ASN kidney week 2012.